Happy Monday and remember to start each day off on a positive note with #ThatBusinessShow, airing weekdays at 8am on #1250WHNZ. All shows available On Demand at http://www.tampabayradio.com and on my YouTube Channel at http://www.youtube.com/jamiemeloni. My opening guest today was Ulrik Pedersen, Chief Operating Officer with TARGIT, a Danish based information solutions company that has launched operations in the United States, of which Ulrik is in charge of. Since 2006, Ulrik has grown the US market share of this company and this market now accounts for 40% of new software sales in 2015. TARGIT’s product is a software program that can pull information from virtually any type of system including Excel spreadsheets and consolidate the information into useful and recognizable information that you can use to hone your business. Current clients include Tommy Hilfiger and many wine companies and Ulrik points out that their target customer is a medium sized business that is looking to capitalize on the wealth of information hiding inside different databases. Ulrik is a dynamic sales professional and prior to the IT career, he served one year for the Danish Defense Forces in the Artillery. He has completed several Marathons and an Ironman and was a semiprofessional Harness Horse Driver in Denmark up until moving to the United States. Ulrik and TARGIT are currently hiring new sales professionals and you can learn more by contacting Ulrik directly at 813-933-4600 or email at up@targit.com and visit http://www.targit.com for more information on the company and their product! 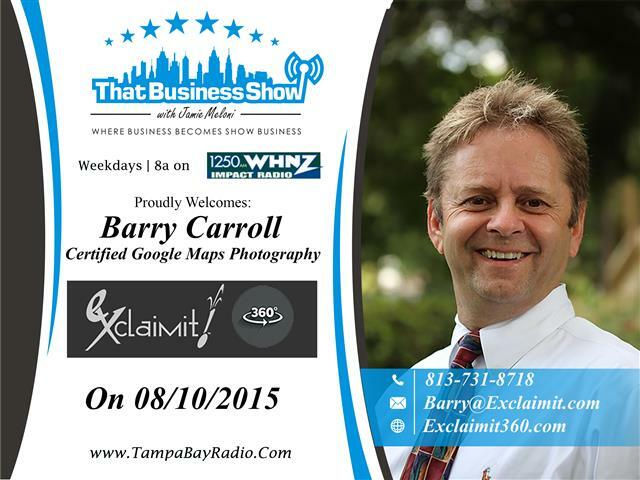 On the 2nd half of the show, I spoke with Barry Carroll, Certified Google Maps Photographer and President of Exclaimit360.Com. Barry has been involved in marketing operations is entire career and his company provides 360 degree virtual tours to any business or Real Estate professional. He is one of the first to bring the 360 degree virtual tour technology to the Tampa area market as well. Barry opens the segment by explaining what it means to be a Google Certified Photographer and how he got involved with the company last year. Today, he works as an independent contractor with them photographing the insides of businesses to give consumers the ability to look and shop from home so to speak or to be able to know the layout of a building prior to entering it. Barry also talks extensively on the value of Google+ for business owners, something he learned much more about since his relationship started with Google. While many people see Google+ as just another social network, it is also a business value builder because of its tie to the power Google search engine. By posting business relevant information on the site, you are giving Google search engines firsthand information on how and what your business is about and Google puts that site before others. In addition, this is a free, easy to implement marketing tool that any business owner can implement today. Barry also shared some other great sources to help analyze and grow your business including the website http://www.gybo.com that stands for “Get Your Business Online” and http://www.google.com/trends. Both of these sites have useful tools that analyze your search rankings and on hashtag campaigns, another talking point we covered on the last segment of this show. Catch the replay On Demand for the August 10th show if you missed this one. Available at http://www.tampabayradiocom via the show info tab and YouTube for the video at http://www.youtube.com/jamiemeloni. Reach out to Barry for more information and for virtual tours at 813-731-8718 or email at barry@exclaimit.com and learn more at http://www.exclaimit.com! This entry was posted in Entrepreneurship and Business and tagged 360 degree virtual tours, business, foreclosures, google+, real estate, virtual tours. Bookmark the permalink.